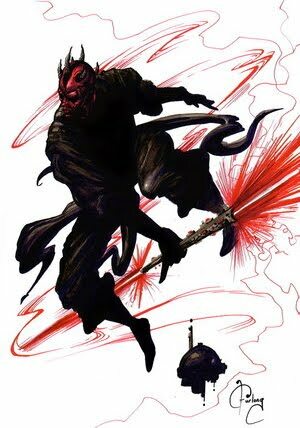 Okay so the amount of screen-time Darth Maul got in Star Wars: The Phantom Menace was criminal, but the portfolio of Wade Furlong is anything but. Using a minimal range of colours (unless teaming up with other artists) and strong graphical line-work, he has created a section on the encyclopaedic website of artists that doesn't just make you stop - it also makes you think. His pieces featuring the likes of Maul, Doctor Strange and Batman vs. Joker, all show how solid his artistic skills and eye are. Then there's the other side of his portfolio that really gives the brain something to chew on; where he takes a surrealist approach to anatomy, and creates an all new take on the subject of each piece (whom more often than not is that rarely illustrated little guy, Wolverine). To see more of his work, visit Wade's deviantART page after the jump. Darth Maul was the only good thing about the phantom menace. so of course they give him just 3 lines and cut him in half. i think lucas should have been given a cat scan before he wrote that script. i'm no M.D. but i'm goddamn sure they would have found something wrong with his brain. which would have explained episode 1,2 and 3 of the Star Wars series. Yeah David - I couldn't believe Darth Maul was chopped in half so soon!